The Star Trek franchise is immensely popular today but in the early 1970s after the series was cancelled it only had a small following. 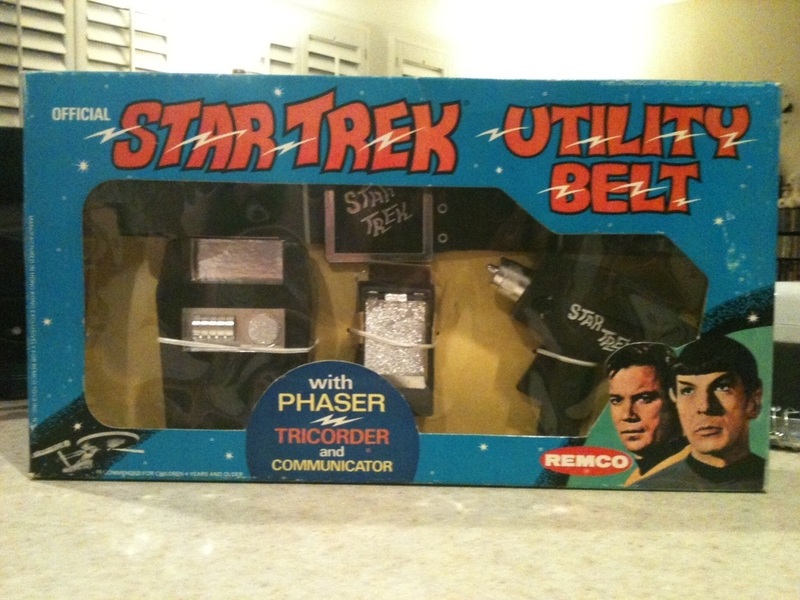 Various attempts were made to keep the storyline alive, such as the young children's animated series in 1973 (which is why most of the toys for Star Trek during this period are made for tiny hands- a great example of this is the Remco Star Trek Utility Belt). It wasn't until the series had a rennaissance in syndication in the mid 70s that it got hot again. 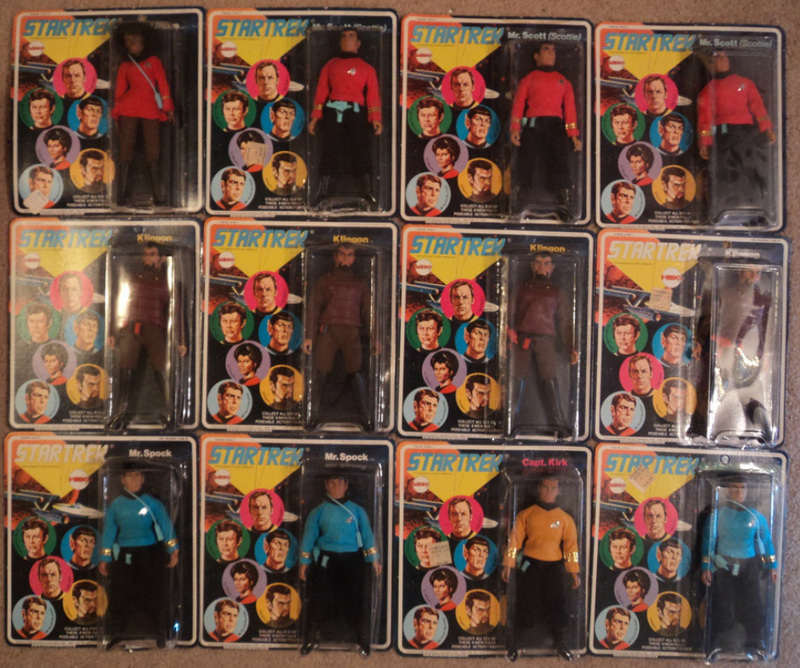 Enter the Mego Star Trek line of action figures, the first ever licensed Star Trek "dolls". After enjoying a lot of success with the figures and playsets Mego expanded the line into electronic play accessories like Super Phaser Target Games, Star Trekulators, life sized Tricorders and Communicators, etc. 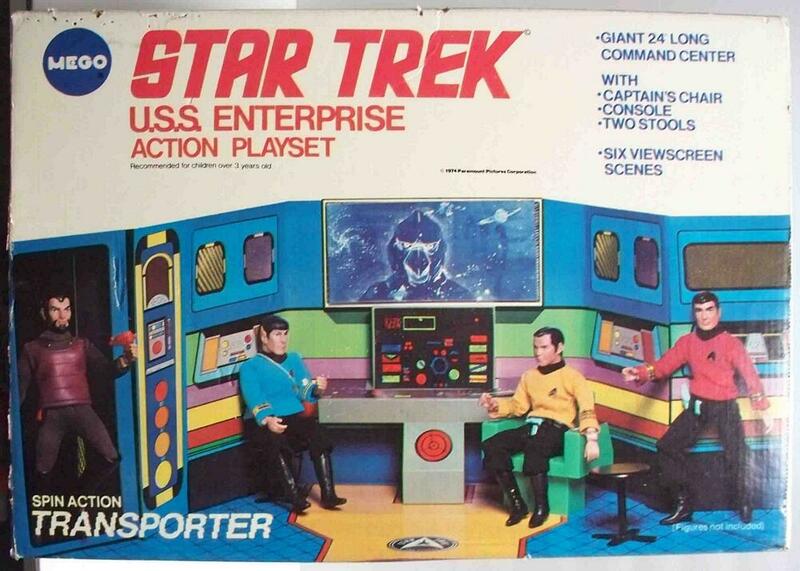 Scroll down to see a history of Star Trek toys. Early versions of Star Trek toys were made by companies such as Remco, Ideal, and Habro with other items such as lunch boxes, model kits, and costumes made by Aladdin, AMT, and Collegeville Costumes respectively. Mego picked up the Star Trek license in the early 1970s and for almost a decade was the most prolific manufacturer of Star Trek items around. Mego's products included a full line of action figure toys, playsets, accessories, and electronics. Click here for the Mego Star Trek Tricorders 1970's Department Store Find! 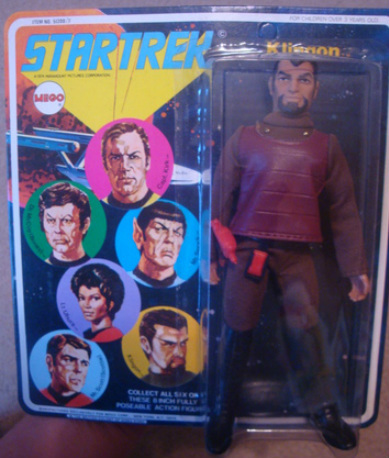 Mego's line of Star Trek Action Figures were made similar to their existing 8" format that had previously been used for their Action Jackson line but the bodies were updated and improved. These new bodies, commonly referred to as "Type 1" bodies were fully articulated with metal riveted joints and strung internally with stretchy string. The Stark Trek male crew bodies were slightly different than the other bodies Mego used for their World's Greatest Super Heroes, Starsky & Hutch, Happy Days, and other lines in that the black boots were permanently attached to the lower leg (more properly stated the lower leg was actually molded into a black boot). The original series featured five characters including Captain Kirk, Mr. Spock, Dr. McCoy, Mr. Scott, and the Klingon. 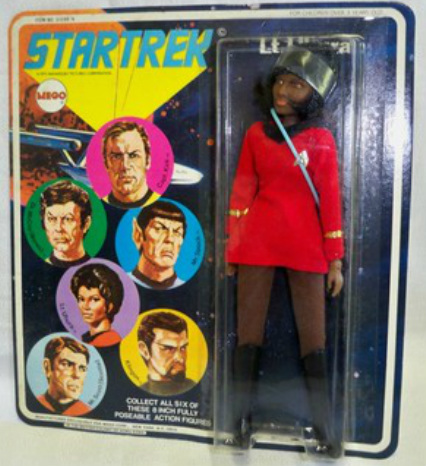 Shortly after the launch Mego added Lt. Uhura to the line and updated the bodies yet again to the "Type 2" version which they maintained throughout the rest of the 1970's and into the 1980's. Type 2 bodies featured plastic rivets instead of metal and had the articulation much improved by use of a rubber band system that holds the arms and legs to the torso and pelvis. As the popularity of the line continued through 1975 and 1976 Mego greatly expanded the line adding Alien action figures, the USS Enterprise playset, and many other electronic toys and games. Captain Kirk was one of the more popular characters in the Mego line. Kirk came complete with gold command uniform, black trousers, utility belt, blue phaser, and communicator. Equally, if not more popular in the Star Trek line was Mr. Spock. 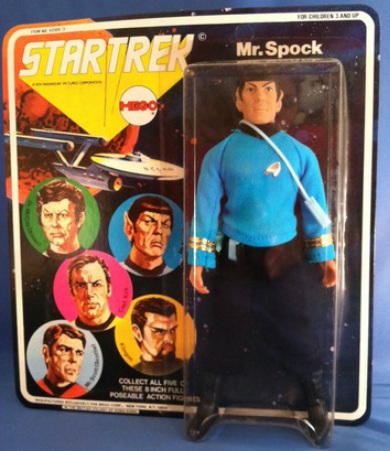 The Spock action figure came complete with blue science uniform, black pants, tricorder, utility belt, blue phaser, and blue communicator. Shown below is an original 5 face card. 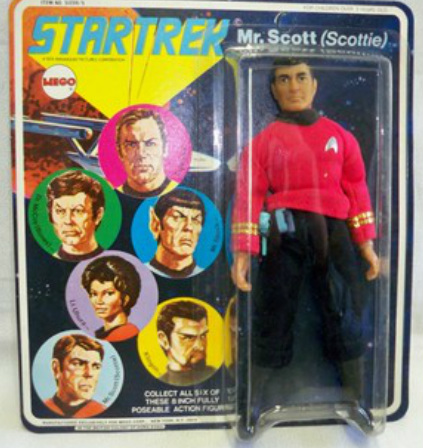 Scotty, or "Scottie" as the packaging says, featured a red engineering/ security uniform, utility belt, blue phaser, and blue communicator. Scottie was one of my favorites and from what I remember he lost his head more than once in order to be transformed into a nameless security guard as they also wore the ubiquitous red shirts. The Klingon was the token enemy action figure for the Star Trek series and is not to be confused with the later "Alien" line that was part of its later expansion. The Klingon used a normal 8" male body with no molded black boots. Instead, the Klingon featured removeable boots. Completing this figure was his brown outfit, utility belt, red phaser, and red communicator. 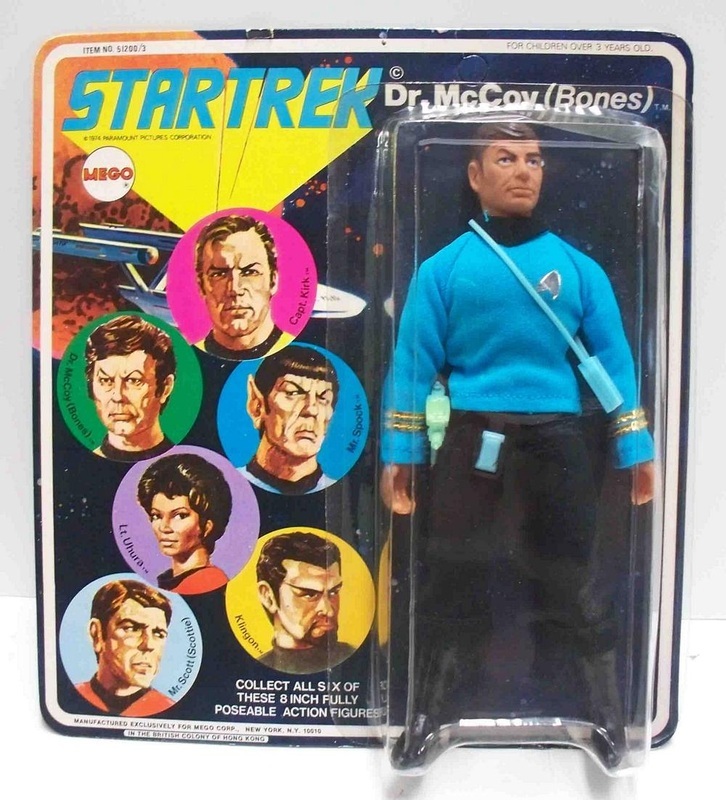 Dr. McCoy's figure featured a blue science tunic, tricorder, utility belt, blue phaser, and blue communicator. Uhura was very likely the least sold action figure which is unfortunate because the figure is very well done and quite beautiful. I remember well seeing the store shelves bare of all figures except Uhura and maybe the Klingon who I believe was runner up for least popular. Uhura featured a red engineering uniform, brown leggings, and a blue tricorder.